We all want to be healthy and fit, but how many of us really know how? At Body Design, we know that every BODY is different. You may be leery about exercise because you don’t know what works or you may choose the comfort of unhealthy food because it is easier than trying to understand “eating healthy”. Body Design recognizes that what this really means is you haven’t found the right program for YOU. Whether you are new to exercise or a veteran finding it hard to stay motivated by old routines, a Body Design Certified Trainer will assess your physical condition, discuss your objectives and concerns and work with you to attain an achievable and realistic fitness plan. It doesn’t end there! Body Design is committed to providing a true lifestyle approach to health. A Registered Nutritionist is able to assess your eating patterns and with you, develop practical and effective changes that will be easy to achieve. Follow up assessments keep the plan highly individualized and extremely effective. This is not fad dieting but instead the foundation for a true lifestyle change. You will become empowered with the knowledge to make healthy food choices. Body Design offers a personalized holistic approach to fitness training and nutritional counseling in a private, one-on-one studio setting. At Body Design, our goal is to provide our clients with healthy lifestyle coaching, establish realistic goals and develop sustainable new habits, patterns and routines that can be maintained long-term. We’ll regularly monitor your progress to ensure that you reach your targets, whether nutritional, fitness, weight loss, stress reduction or other health issues you wish to better manage. On of the greatest pleasures at Body Design is to see a client leave our program feeling confident about their new healthy lifestyle habits which they can sustain on their own. Having taken her own healthy lifestyle journey, owner Kim Mortson’s interest in inspiring others to do the same led to the launch of Body Design, a home-based, private personal training studio which started as a part-time venture in 2002. Within its first year, Body Design became a permanent full-time commitment. With an emphasis on value-added service, Body Design continually increases it offerings to address client and community needs. 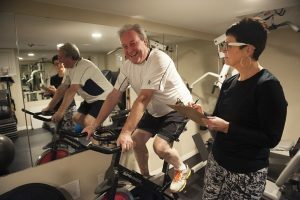 Initiatives such as urban pole walking, wellness programs, strength training for cancer survivors, educational forums, yoga and pilates classes, walking and running clubs, cooking workshops, sports bra fitting sessions, and monthly electronic newsletters have expanded Body Design’s clientele and helped to spread the word of healthier living. By offering tailored services that focus on manageable change, challenges and choices, Body Design is able to provide clients with the motivation, support, and resources for success. Body Design also prides itself on also being a compassionate corporate citizen, donating time and resources to a variety of local fundraising efforts, charities and community events. Branching out into the community, Body Design has worked with a diverse group of corporate clients and York Region’s municipalities and hosts staff wellness programs at a number of York Region District School Board sites.